Traditional Dublin coddle is an authentic Irish meal that you can serve your family for dinner tonight or on St. Patrick’s Day. Layer slices of onion, bacon, pork sausage, and potatoes in a Dutch oven and let it coddle in the oven. Serve this with traditional soda bread or boxty bread and this easy budget dinner will be a hit at home or at a party. This post was originally published on February 22, 2018. Are you looking to try an Irish dish to celebrate St. Patrick’s day? This Dublin coddle takes only a few ingredients, is economical to make, and tastes great the next day, if you have any leftovers. Dublin coddle is an Irish comfort food that you can proudly serve your family for supper on a cool rainy night. It is a hearty dish made with bangers (sausage) and rashers (bacon) along with potatoes and onions. Since it was a dish that was popular with the working class in Dublin, it was made with water (a white coddle). Now a days, Dublin coddle is also made with oxtail, vegetable, or beef broth (a brown coddle). It is also the stew Dubliner’s choose to eat when they are feeling under the weather, much like chicken soup for Americans. What is the origin of Dublin coddle? This dish can be traced back to the 1700’s to the city of Dublin, Ireland. In Irish catholic homes, back when meat wasn’t supposed to be eaten on Fridays, it was traditionally served for supper on Thursdays to use up leftover pork. The Irish housewives would make a up batch of stew earlier in the day and let it coddle, or cook slowly, in the oven for hours. The rest of Ireland didn’t really eat this dish because the bangers and rashers were cheaper and easier to find in the big city. Country folk would opt for Irish stew made with mutton (lamb), as this meat was plentiful. Why are sausages called bangers in Ireland? During WW1, the sausages were made with little meat, mostly scraps and water. When the housewives would fry up the sausages, they would sizzle and make banging sounds. The word bangers was coined and the term stuck. How do you define the culinary term coddle? In English, coddle means to cook food in water before boiling, but in French it means to boil gently, parboil, or stew. Today, the term coddle is commonly referred to a method of cooking an egg. How do you make an authentic Dublin coddle? Since there are many versions of this recipe, there is a lot of debate about how to make this dish. Purists would use plain water, keep the sausages whole, and definitely wouldn’t brown the sausage first. They would also not add any additional ingredients, or layer the ingredients in the pot. They would put all the ingredients into a Dutch oven, bring it to a boil, and let it coddle (simmer) for hours on the stove top or in the oven. Now a days, you will find many home cooks making a more flavorful version by browning the sausages and using beef stock. You will also see more recipes that add other ingredients like carrots, pearl barley, cabbage or milk. What do you serve with Dublin coddle? Dublin coddle is traditionally served with Irish soda bread or Irish brown bread to help soak up the broth from the stew. It can also be served with a strong cup of Irish tea. How do you make Dublin coddle? Gather the ingredients and slice the onions. I used bratwurst instead of bangers and bacon in place of rashers. Cut the bacon into one inch pieces and fry in the Dutch oven. Once crisp, transfer to a paper towel lined plate and blot the excess grease. Remove all but 2 tablespoons of bacon grease from the pan. Brown the sausage for two minutes on all sides. Remove the extra grease from the sausage and cut into smaller pieces. If you want, you can keep them whole. Use 1/4 cup of beef stock and a wooden turner to deglaze the fond from the bottom of the Dutch oven. Layer in the sliced onions, cooked bacon, and fresh parsley. Add a layer of browned sausage. Finish it off with a layer of peeled and coarsely chopped potatoes, a sprinkle of parsley, and a few grinds of fresh black pepper. To save time, I boiled the beef broth in a separate pot then poured it over the coddle. If you’d rather not dirty another pot, pour in the broth. Bring it to a boil and simmer for 30 minutes. Cover the Dutch oven to get a good seal. Choose a tight fitting lid, two layers of foil, or one layer of foil with the lid. This dish will steam in the oven, so it’s important to get a good seal. Bake at 450 F for 40 minutes covered, then uncover and bake for 25 minutes or until brown on top. If you want, add a few pats of butter for the last 25 minutes of baking. Don’t add salt. There is plenty from the bangers (sausage) and rashers (bacon). Want additional spices? Try a parsley, bay leaf, fresh thyme, garlic or a dash of allspice. Want it brown on top? Add a few pats of butter on top during the last half hour of cooking. Want to add more vegetables? Try carrots, cabbage, leeks, Brussel sprouts or tomatoes. Want to make it more flavorful? Sweat the onions, release the fond with broth, and add a splash of vinegar. Want to add a grain? Try pearl barley. Want to add dairy? Try milk or cream. The onions and potatoes can be wedged, cubed or sliced. Celebrate St. Patrick’s Day with these other Irish recipes. 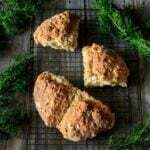 Oregano Onion Soda Bread: this savory twist on traditional soda bread is quite tasty. 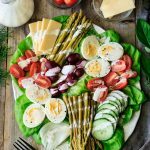 Irish Pub Salad: a simple, healthy lunch idea packed with veggies and boiled eggs. 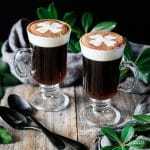 Non Alcoholic Irish Coffee: a family-friendly version of the classic Irish drink. The pleasure of a 5-star review of this Dublin coddle would be greatly appreciated. Fry the bacon in a large oven-proof Dutch oven set over medium-high heat. After a couple of minutes, turn the heat down to medium. Cook the bacon until golden brown and crispy, then drain it on a paper towel-lined plate and blot off the excess grease. Pour most of the bacon grease out of the pot and into a small bowl. Put the bacon grease in the fridge to harden, then discard. Wash and peel 6 medium potatoes. Slice each potato into 1/4 inch slices, then cut the slices in half to get smaller pieces. A thinner potato cooks faster, so if you’re in a hurry, cut the potatoes in smaller chunks. Peel and slice 3 large yellow onions into 1/4 inch slices. Pour the 3 1/2 cups of beef broth into a medium saucepan. Cover with a lid, and bring it to a boil. Brown the outsides of the pork sausage in the reserved bacon grease. Cook for 2-3 minutes per side over medium-high heat. After a few minutes, turn the heat down to medium. When the sausages are browned to your liking, transfer them to a large cutting board. Blot off the excess fat and cut into one-inch pieces. Deglaze the pot over medium-high heat with 1/2 cup of the beef broth. Use a wooden turner to scrap any browned bits off the bottom of the pot. Rinse, blot dry, and coarsely chop 1/3 cup fresh parsley (roughly two large handfuls). Layer the prepared ingredients in the oven-safe Dutch oven as follows: onion, bacon, half of the parsley, sausage, potato, rest of the parsley, and black pepper. Pour the hot beef broth over the stew ingredients in the pot. Cover the pot with two layers of foil or an oven-proof lid. Cook in the oven for 40 minutes at 450 F. Remove the foil and let it cook for another 25 minutes or until the vegetables are a nice brown color. Add a few pats of butter during the last 25 minutes if you want. Serve warm in a bowl with Irish soda bread. Garnish with a sprinkle of freshly chopped parsley and few cracks of black pepper. If you prefer to cook this at a lower temperature for a longer period of time, try 300 F for 3 to 5 hours.